There are still countries today whose citizens live in that kind of world, where each day is a struggle, people go hungry, water is scarce, and violence is an everyday occurrence. There are places, too, here in the United States where this is the rule, not the exception. Americans live in a country where everyone may be free, but the quality of that life remains nasty, brutish, and short. In the world, there are many still in these (metaphorical) chains. Independence in America means the political right to pursue our human rights of life, liberty, and happiness. The political ideal has formed a society based on these principles. Americans have the great fortune of living in a country where the civil structure of society promotes life, liberty, and the pursuit of happiness. The civil structure promotes this. The civil structure is not the government, it is not the laws, it is not the debates or the representatives or the President or the Supreme Court. It is me and it is you. We are the civil structure of the United States—all of us, together. But sometimes it can be difficult to support someone else’s inalienable human rights: “What happens when their liberty interferes with my own?” “What if they advance further, faster than I do?” “What if their success means my failure?” Keeping up with the Joneses means knocking them down; advancing at work means subverting a colleague; getting a date means backstabbing your best friend. The tendency to inhibit someone else, hold someone down, cut someone off, sometimes seems like a matter of personal survival, derived from one’s own desire for life. This is an old question—how do people balance their own rights, survival, even success, over and against everyone else’s? In a civil society such as ours, predicated on life, liberty, and the pursuit of happiness, we have a choice. Either we support a society that supports all our rights, or we regress to a society in which everyone’s right is restrained. With each act we take, each word we speak to each other, we make that choice. We either support and encourage life, liberty, and the pursuit of happiness, or choose a life that is nasty and brutish. Of course we do not see the results of our choices immediately, but each choice adds to the whole of society—and together we are moving that society towards whatever-it-will-become. Add one pebble to the scale on the side of “nasty and brutish” enough times and the scale will tip that direction. In a very real sense, this is why kindness matters. Disrespect disrupts peace; kindness cultivates peace. This is why respect matters. This is why honoring each other’s choices matters. Without these things in daily life, we degrade the very fabric of a society built on an ideal of personal freedom. With every rude act, with every impolite gesture, with every impatient curse or slap or menacing action we add a pebble to the side of the scale that inhibits another’s life. People desire deeply their right to live. People deserve a life that is rich and deep and vibrant; that is more than mere survival. Life expands where it is safe to do so; where there is a threat of harm, life contracts, recedes, stays safe, merely survives. We are all constantly contributing either to each other’s expansion or contraction. No one is free when any one behaves in a way that restricts another’s freedom. Honor and be honored. Respect and be respected. Live and let live. Begin with yourself, within yourself. This is the foundation for a peaceful coexistence, giving life the opportunity to expand and spread its wings. 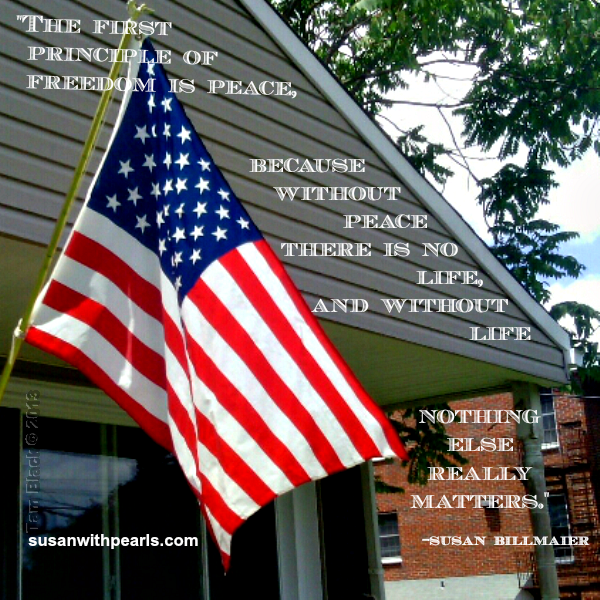 The first principle of freedom is peace, because without peace there is no life, and without life nothing else really matters. Do you know this story, “A Single Starfish” by Loren Eiseley? –One day an old man was walking along the beach. It was low tide, and the sand was littered with thousands of stranded starfish that the water had carried in and then left behind. The man began walking very carefully so as not to step on any of the beautiful creatures. Since the animals still seemed to be alive, he considered picking some of them up and putting them back in the water, where they could resume their lives. The man knew the starfish would die if left on the beach’s dry sand but he reasoned that he could not possibly help them all, so he chose to do nothing and continued walking. “I’m saving the starfish,” the child replied. “Why waste your time?… There are so many you can’t save them all so what does it matter?” argued the man. That’s how I feel about worms. You know, after a rainstorm the parking lots are filled with worms which, drowning in the soggy ground came out onto the concrete only to die in the sun or continue drowning in puddles. So, I go around picking them up. I take them to “higher ground” and cover them a bit with dirt or leaves hoping they recover; giving them a chance at recovery, anyway. I once read of a Buddhist temple being built; the excavation was a long, tedious, process. The monks were preparing the land by hand—I picture the tedious clearing of an archaeological find—so they could gently transplant each creature in the dirt (worms!) to a new home. In the Buddhist tradition, every being is a mother, a father, a sibling, a son/daughter, or a friend. All life has value. All life is sacred…even worms. I even have “pet” worms. Yes, I vermiculture. Worms eat my garbage. What is this affinity that I have with worms? I did not always feel this way about worms. In a snow storm this past winter, which dumped inches-to feet-of snow on the northeast, I was walking to my back door and found a worm on the sidewalk. “What! You are quite out of place!” I said to my little friend. But I had a dilemma: snow on the ground, worm on the sidewalk. What do I do? If I put him back into the “grass” he will freeze. There was no higher ground, no safe place where I could put him outside; what do worms do in the winter, anyway? So I took him inside and placed him (it?) gingerly into the dirt of my Christmas cactus. So I did a good deed. I saved a worm from dying in the snow. Or did I? What if he dies at my hands? I am responsible. Some people believe that death is a transition into a new life. Some believe that the death of the body is not “death” for the soul lives on. Some people believe that people are “born again” into a new body (reincarnation) or into a life of spirit. Some people believe that death is the end, done, finis (but since you are dead, you don’t care!). So why is death a measure of whether or not the deed is good? How do we know? How do we know when a good deed is really a good deed? What if our intervention causes more harm than good? How do we know? When I was about 8, I had a guinea pig. I was an industrious and caring youngster and wanted my guinea pig to be happy and to live in a nice environment. So I cleaned his cage…with bleach…or ammonia, I don’t remember which. The fumes of my eager cleaning lingered in the small glass tank; my guinea pig died. Eagerly well-intentioned, but ignorant, I was a child. How could I have known that I was going to kill my guinea pig? How do I know if I haven’t killed my worm-friend? We never know, do we? We never know if we create more harm than good, even when well-intentioned. The nature of ignorance is ignorance: the blind spot that prevents us from knowing everything about everything and not knowing that we don’t know. Only in omniscience can we make perfect choices. And I am certainly not omniscient. So I have to live with my ignorance…and my questions…and sometimes my guilt. So I remind myself that I am doing the best I can. I remind myself that there are parts of me, like that child, that just don’t know any better, and I forgive myself my ignorance. I clear my head, listen to my heart, and strive for the best for all, and continue to pick up worms after a rainstorm.